Are Minilaparoscopic (needlescopic) Trocars of 2mm and 3 mm Without Valve and Sealing Membrane a Viable Option? 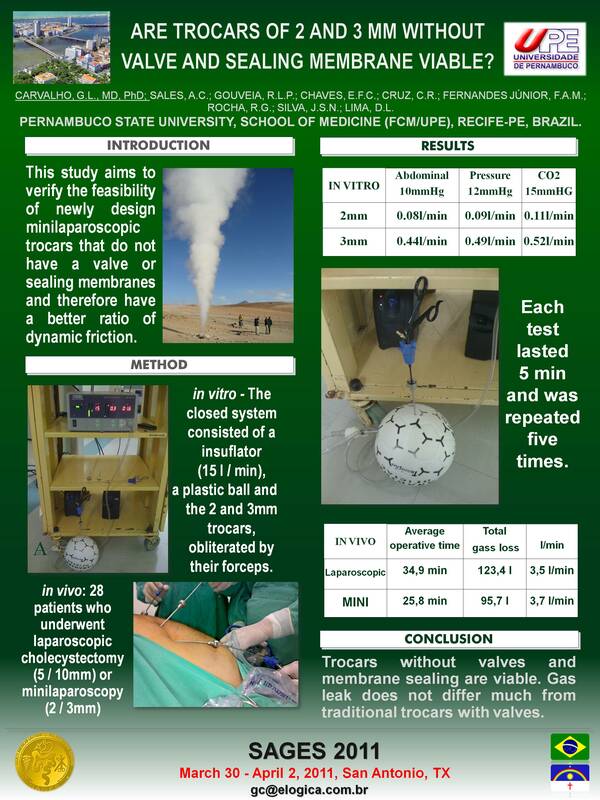 INTRODUCTION: This study aims to verify the usefulness of a new model of minilaparoscopy trocar that do not have a valve or sealing membranes and therefore have a much better ratio of dynamic friction. It is well known that with a lower friction the stress of surgical movements decreases and the precision increases. There was a doubt whether the lack of valve and sealing membrane would impair the use of trocars due to the large amount of gas leak. METHOD: Two experiments were conducted: A) In Vitro – The loss of gas was measured in a closed system. The system consisted of a gas inflator (15 l / min), a rubber ball and the 2mm and 3mm trocars, obliterated by their forceps. The pressures used were 10, 12 and 15 mmHg, in that order. Each test lasted 5 minutes and was repeated five times. Finally it was calculated the average per-minute gas loss. B – In Vivo: It was analyzed 28 patients who underwent laparoscopic (trocars of 5mm and 10mm) and minilaparoscopic (trocars of 2mm and 3mm) cholecystectomy in the University Hospital Oswaldo Cruz, Recife – PE, Brazil. The average of the total gas loss during the procedures was divided by the average operative time. CONCLUSION: It was demonstrated that the 2 and 3mm trocars without valves and sealing membranes are viable and very useful. The experiments showed that the gas loss does not differ much from traditional trocars with valves and sealing. Moreover, the absence of valves and membranes provides a much lower friction, improves trocar dynamics, resulting in much greater precision for surgical movements.